Jay R. Smith Mfg. Co.&#39;s Speedy Solution for J.W. McClenahan&#39;s Drainage Dilemma - Jay R. Smith MFG Co. The engineers at Jay R. Smith Mfg. Co. understand that necessity is the mother of invention, but sometimes she insists ingenuity occurs on a very tight timeline. J.W. McClenahan Co., the design/build plumbing contractor on the Transbay Block 8 mixed use development project located just two blocks from the Transbay Transit Center in San Francisco, suddenly found themselves in a bit of a predicament. While San Francisco's building code stipulates placement of a trench drain that can accommodate a 100 GPM flow of the automatic fire sprinklers in remote areas outside the Fire Service Access Elevator (FSAE) lobbies, the city has become more stringent in the evaluation of drains that can handle the specified flow. City building inspectors and the fire marshal were now requiring full documentation for those drains at Transbay Block 8. 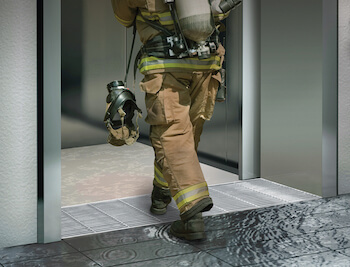 The purpose of elevator lobby trench drains is to prevent water from infiltrating the shaft enclosure and keep the elevator lobby area free of water to allow fire fighters to do their jobs safely. Smith had a standard drain available that met the requirements, but the architects for Block 8 specified lengths that were not yet available anywhere. Rick Kelly, a superintendent at McClenahan, said that one of the problems they faced was that the architects had included different size door openings into the elevator lobbies. Smith had a standard drain available that met the 100 gpm requirement, but the specified lengths were not yet available anywhere. The other issue encountered was the depth of the trench drain due to structural restraints. McClenahan wanted to put the outlets at the ends of the drain instead of the center. That was yet another change that would affect the flow rate. JW McClenahan Co. had two choices. Go back to the architects and have them re-do the design to specify the lengths and depths available or find a manufacturer who could come up with a solution that satisfied the design and met the code at the lengths required. Luckily, Jimmy Garcia, a manufacturer’s representative with Elmco and Associates was aware of the problem and immediately contacted engineers at Smith who got to work right away to design drains that would accommodate the lengths required and the one and 3/4 inch drain for the shallow application. Jay R. Smith Mfg. Co. first tackled the issue of the shallow drain. Smith engineers created and tested lengths from forty-two inches up to 123 inches with outlets in three different positions to ensure water would not overflow the threshold drain and spill into the elevator lobby and hoistway. To meet the SF Fire Department requirements for testing, the drains were promptly sent out for third party testing and verification. Kelly said the whole process, including the much needed third party certification, took less than four months. With that certification in hand, Rick Mesnickow at Elmco and Associates who had been working closely with city inspectors and the fire marshal had proof of the efficacy of the drains the inspectors needed. 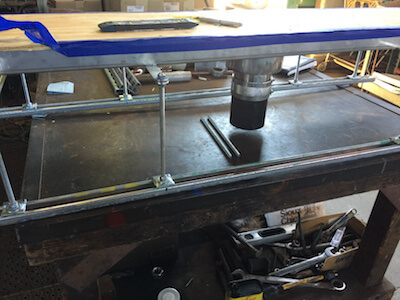 “The biggest benefit was the overall response from Smith which included everything from the design to sending the threshold drains out to a certified testing lab for third party testing. That last step was a significant benefit, and it speaks volumes,” said Mesnickow. However, it did not end there. While McClenahan’s main concern was that the drains met the required flow rate, the architects were also concerned with the aesthetics. The Smith low profile threshold drains utilize one-quarter inch grate spacing, which complies with ADA requirements and is heel proof to help prevent falls and injuries. Mesnickow is trying to get the word out to contractors in other municipalities. While San Francisco was the first to enforce the code, he expects others will follow their lead. “We see the idea starting to migrate across the bay into Oakland where they now require it,” said Mesnickow. It is only a matter of time until contractors across California and the rest of the country see similar enforcement. 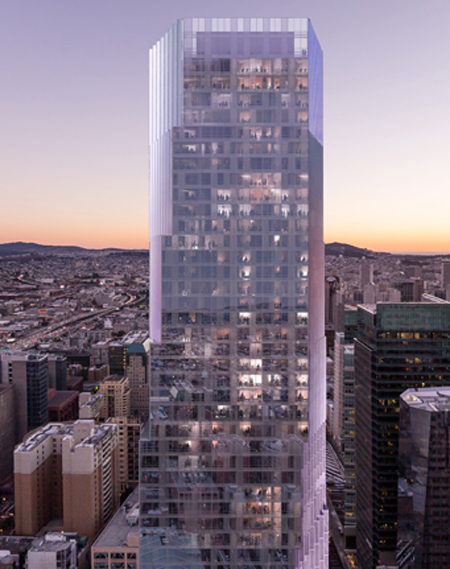 Transbay 8 includes a 56 story residential tower and will have 467-units including 118 condominiums and 279 luxury apartments and 70 below market rate apartments. The ground floor will feature 17,000 square feet of neighborhood serving retail set around an open public paseo. Kelly said they expect to finish the first phase of construction in December of 2019. The entire project is scheduled to be completed in March of 2020. This job was featured in MCAA's Smart Solutions magazine.